Another day, another batch of ornaments. This one is a cute wood birdy, I found at Jo-Ann while hunting for wood ornament blanks. Really lacking there craft stores! I was think about the Tween Patchwork Wood Bird Wall Art, I made last month, and wanted to redo it in smaller scale. I gave it a featherlike appearance with little paint strokes. I chose a palette of green and blue with gold accents. DecoArt Americana Acrylic Paint comes in a rainbow of colors. If you don't have a growing collection of their paints, like I do, I suggest getting this DecoArt Americana 34 Color Value Pack Set from Amazon with a lot of colors and shades to choose from. For metallics, this DecoArt Dazzling Metallics Sample Pack is great to start with. 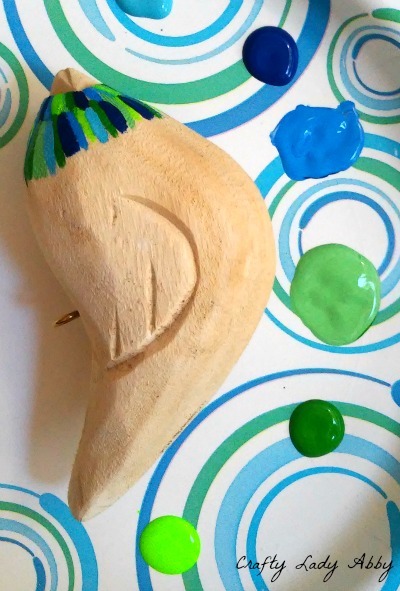 Group the wood bird (or several wood items), paints, and brushes together for a neat crafty gift. This is a great beginners project, as you don't need to be an amazing perfect painter to make something little and cute. 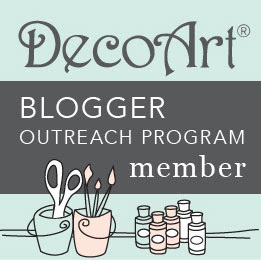 DecoArt sent me the paint for this and many more projects. A little paint goes a LOOOONG way! 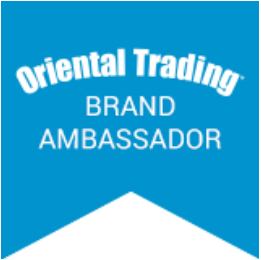 These are Amazon Affiliate links, unless otherwise noted. Any purchases made using the Amazon links, will result in Amazon paying me a small commision. This money normally goes to pay for more craft projects and things for my family. 1) Mix your colors on a paper plate, to get the shades you want. 2) I started painting at the beak and worked to the tail. With the detail brush and one paint color, make small spaced out strokes around the beak. Repeat with other colors, cleaning brush in between colors. 3) Continue painting the bird with the small strokes, working one row at a time. Work in sections, to optimize drying time. Stand or hang the bird up to dry, to prevent paint smears. 4) Paint the beak bright green. 5) Define the wings with the detail paint brush and Glorious Gold acrylic paint. For the eyes, dip the handle end into the paint, and make a dot on the bird in the eye area. This trick is handy for even polka dots. 6) My bird had an eye screw at the top. If yours doesn't have a hole for hang, drill one at the top. 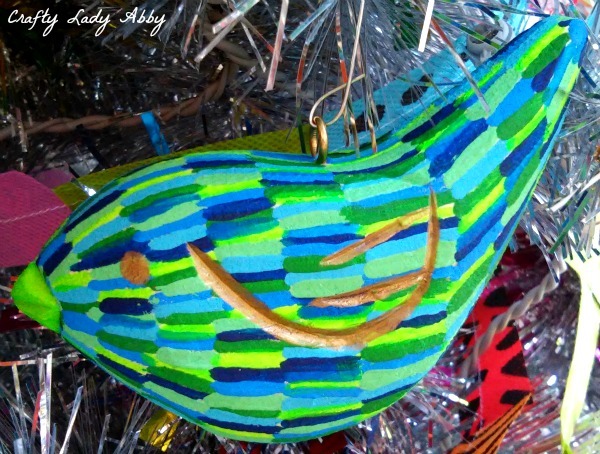 Add a ribbon or ornament hook to the hole, squeezing it closed. 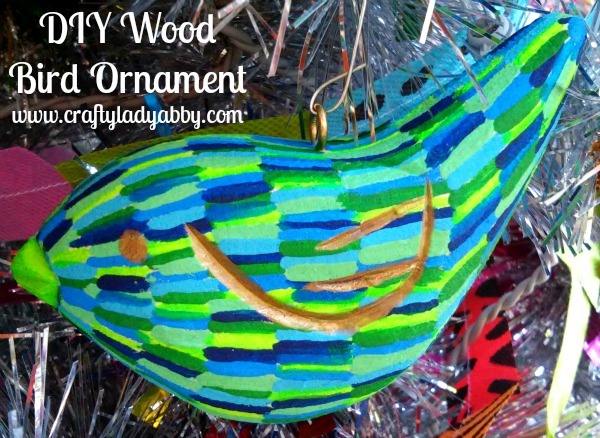 You can use this little strokes painting technique on any wood or paper blank ornament. It would also be cool on a picture frame, if you want something more gifts...because you know it's that time of year and what not. I worked on this birdy while watching the entire Xena series on Netflix...for the 4th or 5th time. I really wish the series was longer, or um was still playing. I'm in season 6, and being miffed about it ending soon. Whatever series you repeatedly watch, I hope you enjoy it and make cool stuff at the same time...multi-tasking for show freaks. Happy holidays and makery!